Since our last post we have traveled roughly 250 miles and spent 3 nights in 3 different campgrounds. Yup, we’re on the move. After nearly 2 months of short distances and prolonged stops it feels good to be truly traveling again. And what a route we’ve chosen! The entire 250 miles has been filled with amazing scenery with some not too shabby stops along the way. Let’s begin where we last left off leaving Clam Beach and cruising through Arcata and Eureka only stopping for some groceries and a few other errands. 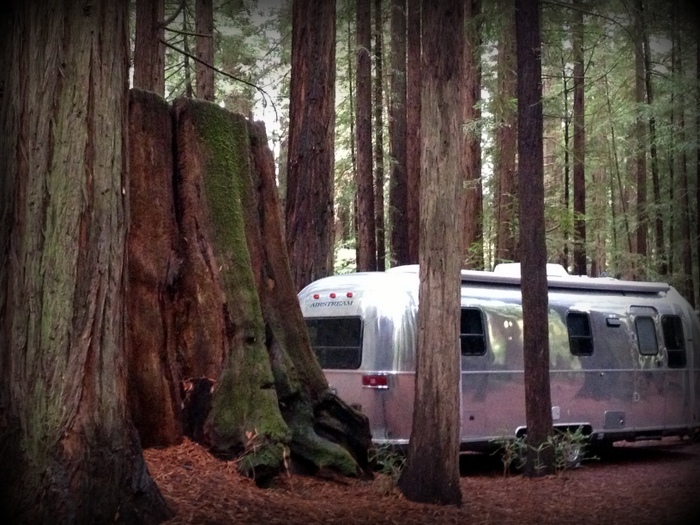 After leaving town we drove down Hwy 101 through the Avenue of the Giants and stopped for the night at Humboldt Redwoods State Park. It was nearly dark when we arrived but we managed to squeeze our way through the tight maze of trees they call a campground to find a nice spot among the giants. In the morning we hitched up and headed out continuing south down Hwy 101 before turning west onto Hwy 1. What came next was nearly 30 miles on the craziest narrow, winding road ever. It was like a maze of hairpin turns, steep hills, non-existent shoulders and hold-your-breath curves. Tim did a great job maneuvering us around all the twists and turns and luckily we only met a few other cars along the way. When we finally made it to the coast the road leveled and widened a bit but the crazy curviness persisted. Oh, but what a view! For miles we drove along tall bluffs that plummeted down to the ocean below with nothing but dramatic views of rolling waves and rugged rock formations as far as the eye could see. We stopped for lunch at one of the many road side pull-offs and decided to stay awhile. I mean why not? The sun was brilliant overhead, the view breathtaking, and the gentle ocean breeze warm and inviting. After soaking in the sun for a few hours we headed down the road to our destination for the night. 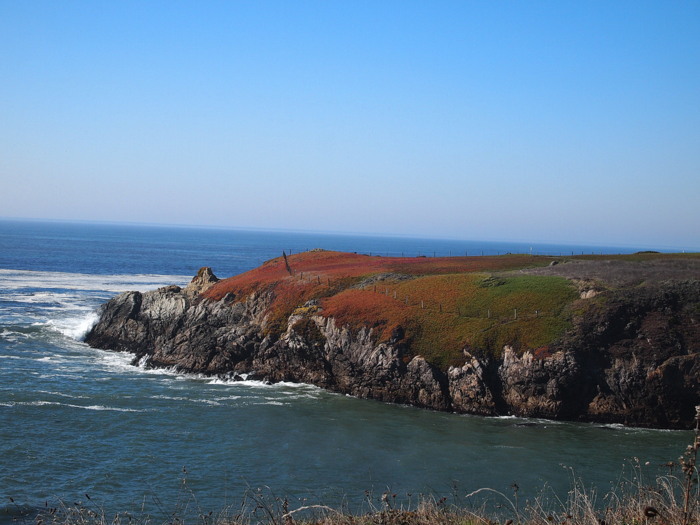 Van Damme State Park is right off Hwy 1 just a few miles south of Mendocino. To be honest we really weren’t that impressed with the campground. 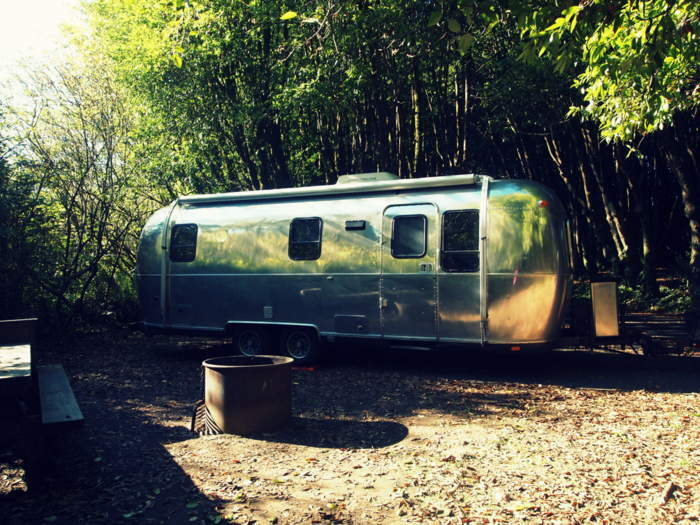 This time of year only one loop was open, and while the sites were large and included a choice of both open sunny spots and those deep in the trees, there was nothing that really wowed us or made us want to stay more than one night. The internet situation was pretty poor (we got a not-so-usable Verizon signal, even with our external amp), so we ended up paying $8 for the visitor center wifi. 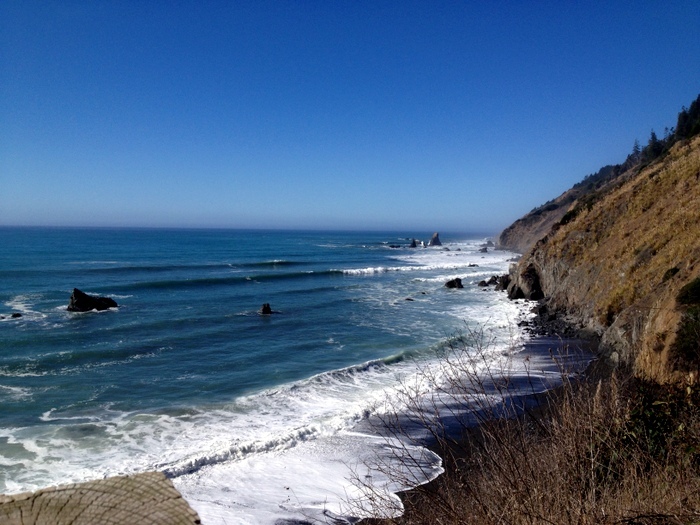 There is a beach across Hwy 1 that’s part of the state park. It too was not very impressive. 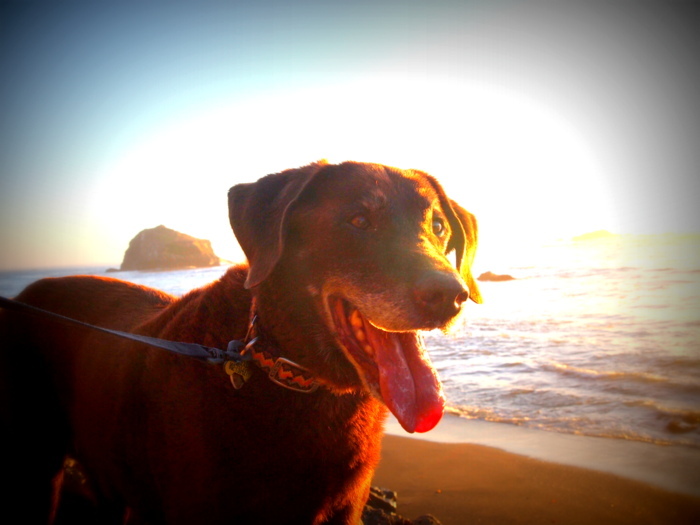 So unimpressive in fact that the only picture you get is one of a very happy Phineas with the beach in the background. Even though we were less than thrilled with the campground we still hoped to enjoy the area. 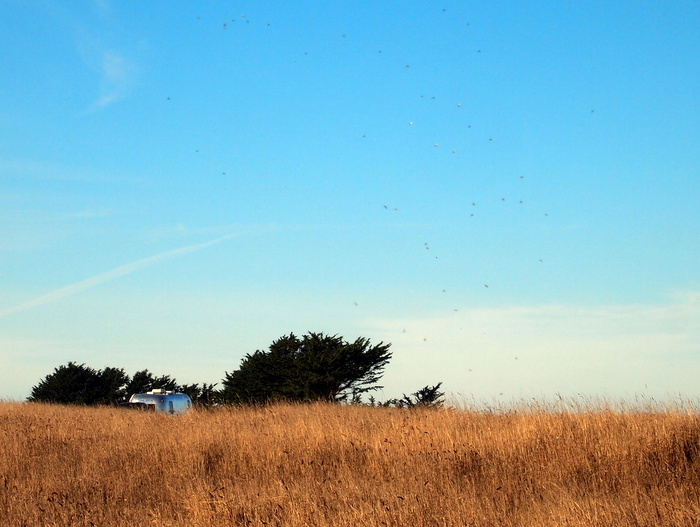 So the next morning we packed up and headed over to the Mendocino Headlands State Park. This is a day use park with no entry fee and a couple of good size parking areas that made for a perfect hang out/work location for the day. 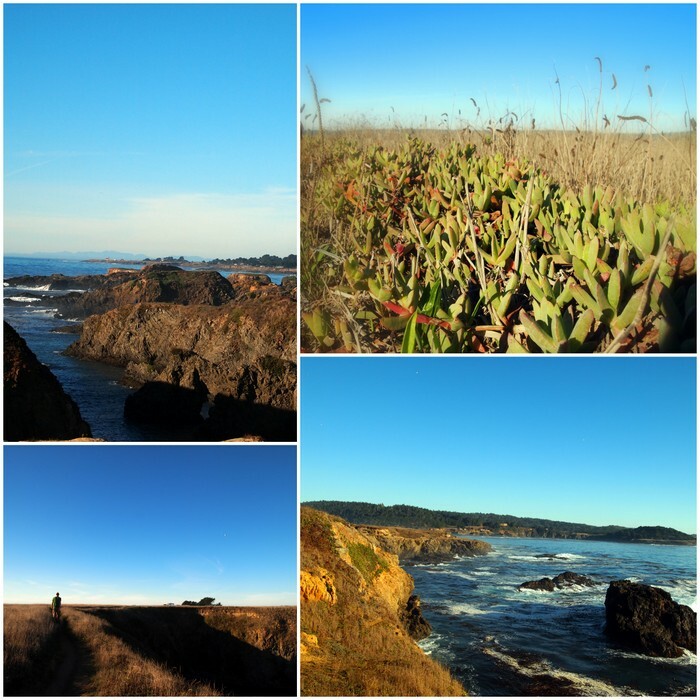 We left Mendocino in the late afternoon and continued down Hwy 1 to a county park in the tiny town of Gualala. It was around six o’clock by the time we arrived and almost completely dark (oh, November) while we drove around looking for a spot. It was our first time backing into a spot in the dark and if I do say so myself we did very well. I wielded my flashlight like some sort of air traffic controller and Tim backed right in like a pro. It was a nice park located in a coastal forest alongside the Gualala River. Unfortunately we couldn’t get even the faintest data signal, either from Verizon or AT&T, which meant it would only be a one night stay. We had a nice evening at the park though. The temperatures had reached the mid-70s during the day and the warmth lingered into the night. We took an after dinner walk up the park road and when we emerged from beneath the trees were greeted with an amazing view of the clear starry sky. 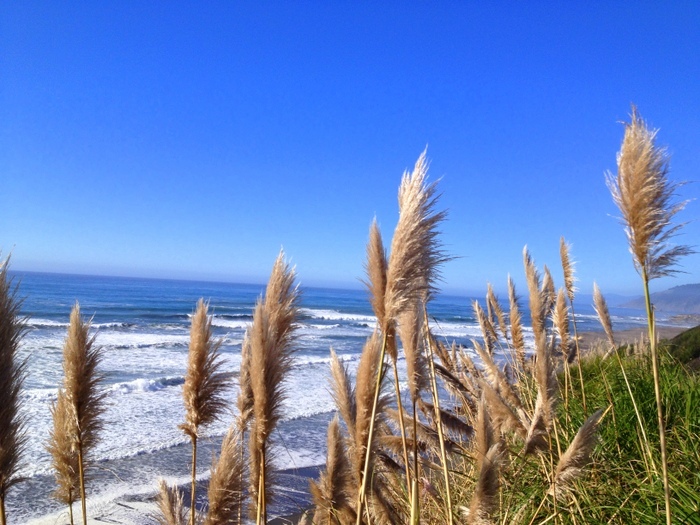 So far we’re loving the November weather here in California. 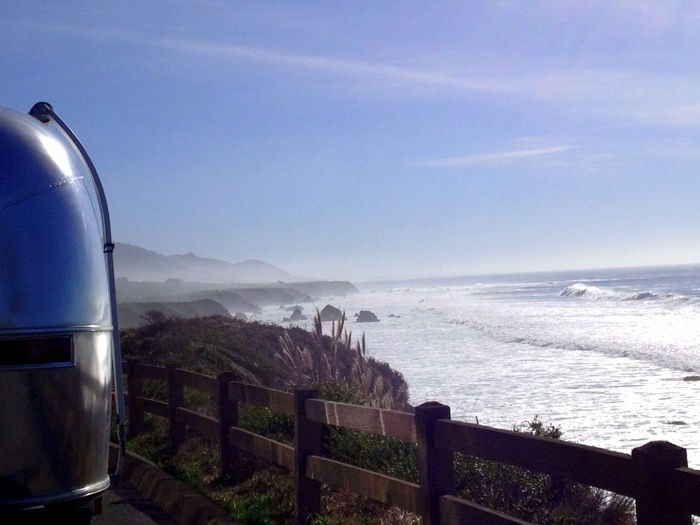 After leaving the park we continued down the coast, marveling at the magnificent views along the winding highway. 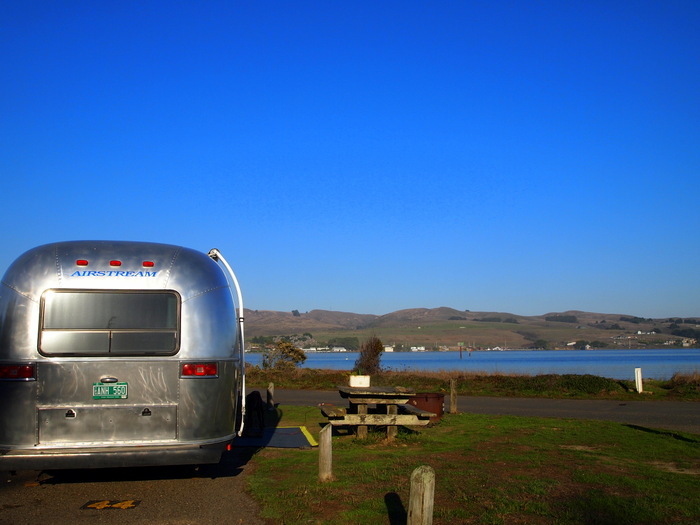 Our destination was Bodega Bay, a small coastal town about 65 miles north of San Francisco. It was only about an hour drive so instead of going straight to the campground we decided to once again spend some time at one of the road side pull-offs along the way with fantastic views. We stayed through lunch and into the afternoon charging our solar panels, soaking in the view and utilizing the fast data signal. 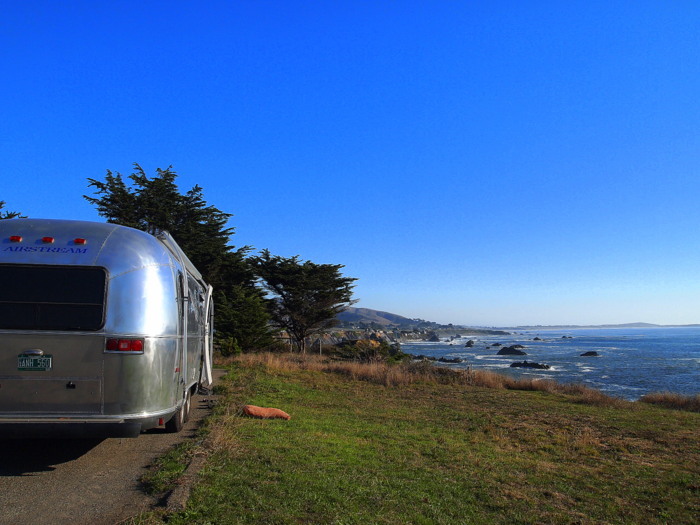 After a productive few hours we moved down the road to the Westside Regional Park where we snagged a site with a great view of Bodega Bay. This time we’ll stay more than one night and look forward to spending the next few days exploring the town and surrounding area. Just found your blog thro’ your comment on mine. LOVE your pics (esp. of the doggie).